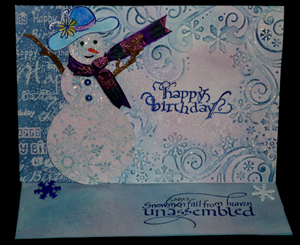 Only one of my cards made it into the January 2012, Vamp Stamp magazine, but that one's on the cover BIG GRIN, and It's using one of the latest winter stamps from Quietfire Design; the other one is in their online gallery.. NOTE: There was a question in the comments of what I squeezed to make the background. I used DISTRESS STAINS. Congrats Yogi, what a stunning card!! So deserving of the cover, my friend! 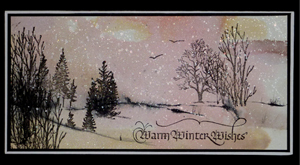 Love the Warm Winter Wishes card....many Congratulations on being on the cover (it deserves to be there) and many thanks for the tutorial....I will have to give that a go! I remember your work from GG Designs and I also see your work in the Bow Valley Calligrapher's Magazine. My sister in Toronto has a friend who is Peggy's mother.....small world. Best Wishes from Northern Ireland. Wowwee! Congrats on being the cover art for VS! You rock- it's a beautiful card! great card. i don't quiete get the first step in the directions, how do you squeeze the ink? is it a reinker? whatever it is so cool. i've seen many variations with tress and this one is awesome.